(Los Angeles, CA—August, 2009) TruFocals are a revolutionary new eyeglass system that allows you to ‘self-correct’ or sharpen your vision to the highest quality necessary for any situation. Completely eliminating the need for multiple pairs of glasses, bifocals, or no-line progressives, the patented TruFocals have none of the distortion or blurriness associated with traditional multi-focal glasses, and widen the field of vision. With TruFocals, your entire lens focuses on what you choose, not just what your multifocals force you to. Simply move the ‘vision correction’ slider on the bridge of TruFocals glasses, and the entire system shifts focus closer or farther, like a microscope. With TruFocals you are not limited to a fixed distance focal length. You can self-adjust your own glasses to provide a clear solution immediately, whatever the distance. As we age, our vision degenerates. Single focus distance/reading, bifocals or no-line progressive lenses have been the only non-surgical means of vision correction…until now. TruFocals’ revolutionary lens system acts like dozens of single vision lenses, allowing you to see clearer in any situation, near or far. TruFocals also eliminate the nausea for wearers who suffer from motion sickness brought on by the distortion / blurriness of no-line progressives. “I began thinking about developing a better vision solution, when I discovered that my own vision was compromised. It was hard to adjust to wearing multifocals, and my vision quality was markedly less. After looking at the mechanics of how the human eye naturally focuses, I began to think about how to mimic this, mechanically. I think everyone who wears multifocal lenses will appreciate the flexibility and clarity of TruFocals,” states co-founder and inventor, Dr. Stephen Kurtin. 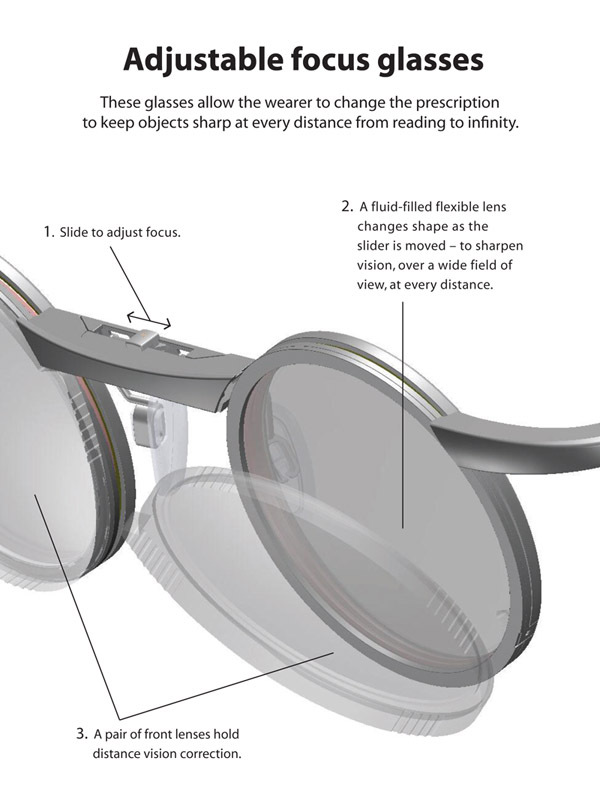 TruFocals emulate the human eye’s ability to adjust focus by utilizing a lightweight two-lens system. As simple as TruFocals are to use, their technology is very sophisticated. Each “lens” is actually a set of two lenses, one flexible and one firm. The flexible lens (near the eye) has a transparent distensible membrane attached to a clear rigid surface. The pocket between them holds a small quantity of crystal clear fluid. As you move the slider on the bridge, it pushes the fluid and alters the shape of the flexible lens. Changing the shape changes the correction. This mimics the way the lenses in your eyes used to perform when you were younger. The sliding movement allows you to choose the exact correction that works best at any distance and under any lighting conditions. Similar to traditional glasses, the front lens can be removed for cleaning, or interchanged with appropriately tinted prescription lenses to be used as sunglasses. TruFocals are the ideal solution for people who wear multifocal eyeglasses, carry separate pairs of distance and reading glasses, or prefer the convenience of self-focusing their field of vision. Because the glasses are ‘useradjustable’, they can compensate for low-light conditions and virtually any situation. With TruFocals, the lenses and the frame are made together, as opposed to the traditional model of lensmakers and framemakers. They also have adjustable nose pads and arms that can accommodate nearly any face. This ensures a comfortable secure customized fit for virtually everyone. The glasses are assembled in their Los Angeles, CA, facility. For additional information, and to view an online demonstration, please visit www.trufocals.com. Media inquiries, please contact Agnes Gomes-Koizumi or Julie Du Brow via email at agnes@agkmedia.com / julie@dubroworks.com or via phone at 323-937-5488 / 310-821-2463. The company was co-founded by Dr. Stephen Kurtin in 2006. A successful inventor, with more than 30 patents to his name, Dr. Kurtin was not satisfied with the exisiting vision solutions. Recognizing that multi-focals, reading glasses or carrying multiple pairs of single vision glasses did not provide a satisfactory solution, he set out to develop a better one. TruFocals were developed to provide clear, adjustable vision in all situations. TruFocals are available through eye care professionals or via http://www.trufocals.com. TruFocals are scratch-resistant and antireflective, contain anti-smudge coatings; and protect your eyes from harmful UVA and UVB rays. This product is covered by one or more of the following US patents: 5,138,494; 5,668,620: 5,956,183; 6,040,947; 6,053,610; and 7,008,054. This entry was posted on October 2, 2009 at 6:58 pm and is filed under Health, Medical, Science, Technology. You can follow any responses to this entry through the RSS 2.0 feed. You can leave a response, or trackback from your own site.